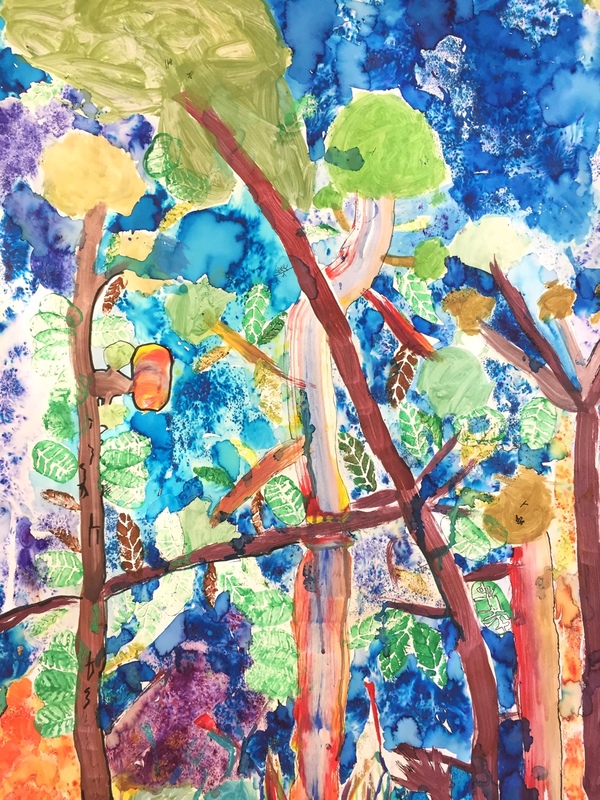 Rachel Burch, Head of Art at Burton Hathow Preparatory School and her pupils paint their own large scale, colourful forest inspired by AccessArt’s resource ‘Painting A Bluebell Forest’. Rachel shares her process below. 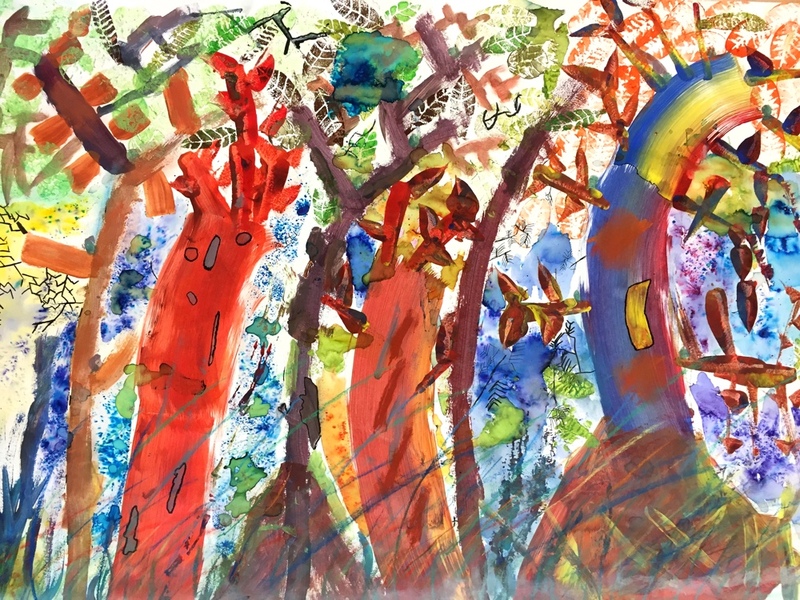 This is the work that my Year 4 class did over a six week period, with a 90 minute art lesson each week. 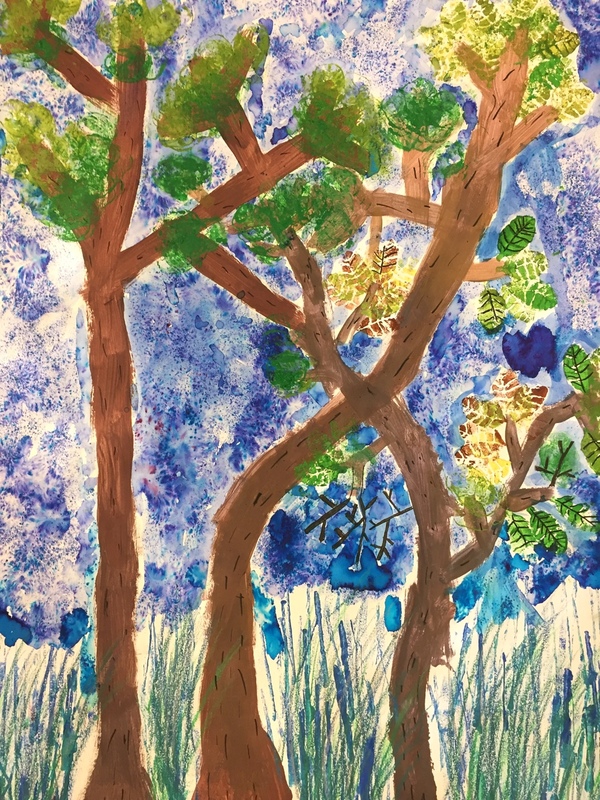 The work was in response to the Access Art resource ‘Painting a Bluebell Forest’. 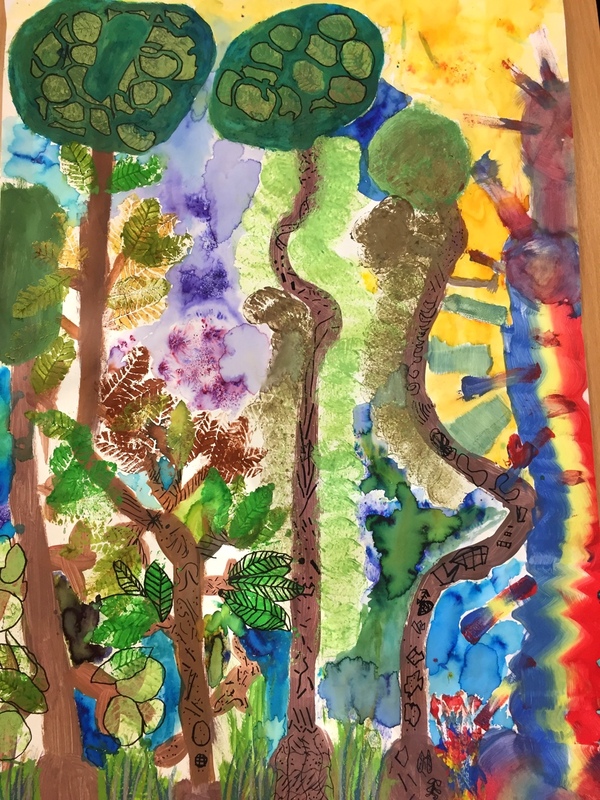 We are a school with woodland and so I used this as our stimulus. 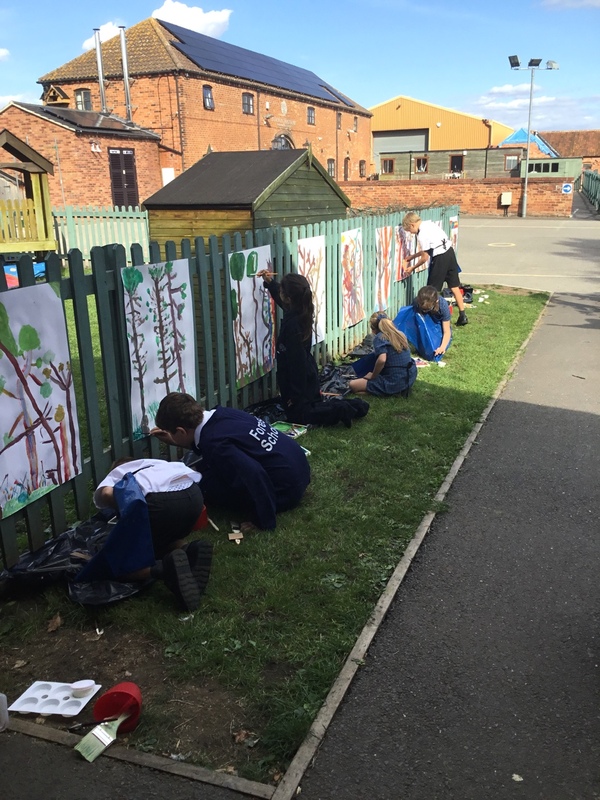 Not having easels, I staple gunned A1 cartridge paper to the fence, children wore their overalls and knelt on bin bags, I think only a couple managed to kneel in their palette! As warm ups we spent about 10 minutes each week exploring forwards and backwards drawing, and thoughtful mark making. We painted outside for 2 sessions. 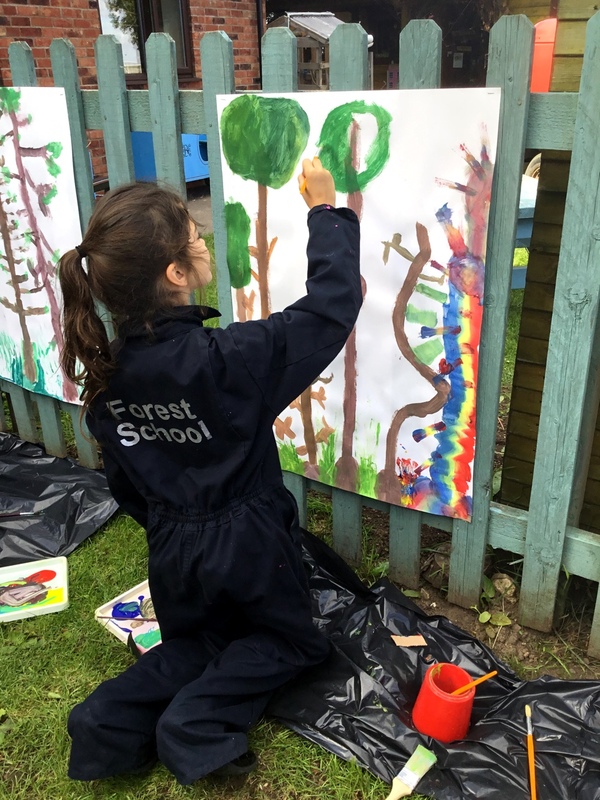 The children had ready mixed paint and palettes, I encouraged colour mixing and gave permission to paint anything any colour. It was interesting to see that they found this liberating and yet still tended towards green leaves and brown branches. 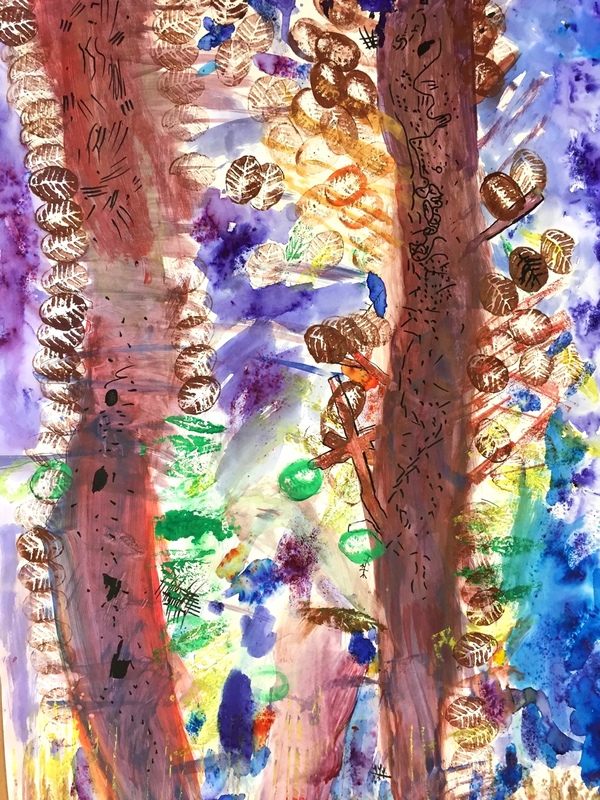 One child discovered ‘rainbow painting’ with a sponge brush and this inspired the whole group to play with colour. 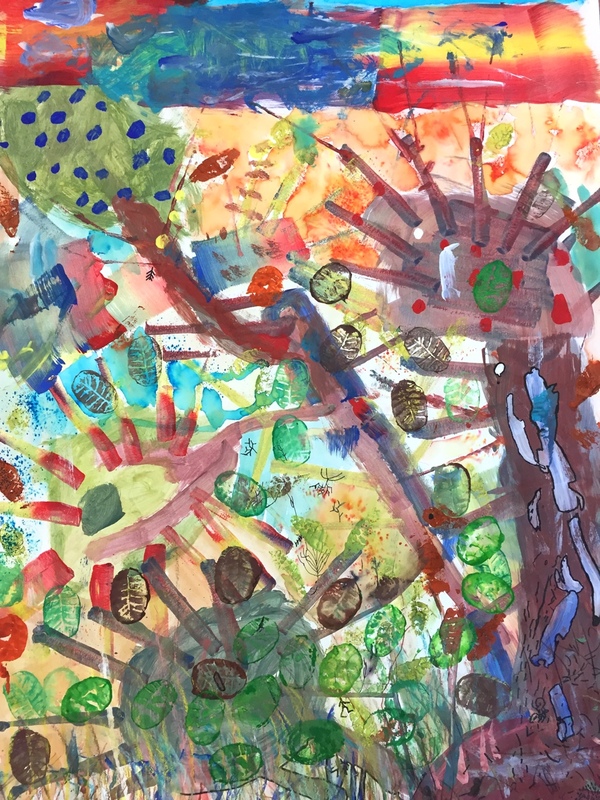 Following on from those lessons, working inside on tables, the children printed leaves onto their paintings using Press-print tiles that they made and also potato prints. 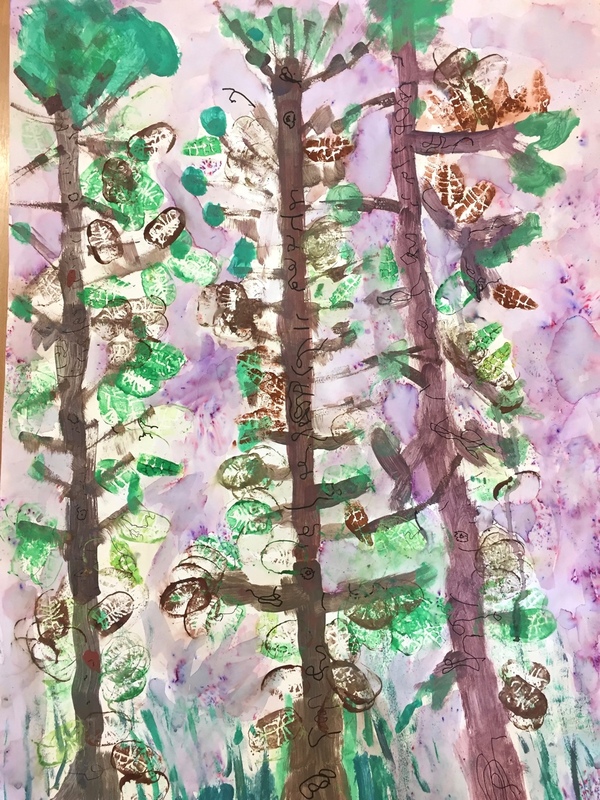 They added fine details of twigs, nests and grasses using pens, pencils, pastels and by printing with the edge of thin card. The final transformative element was adding a Brusho wash to cover any remaining white paper. The children absolutely loved this, finding the colours so exciting. The response to these paintings has been fantastic, all the children were excited and proud of their work. We displayed them in the school hall as a whole forest. 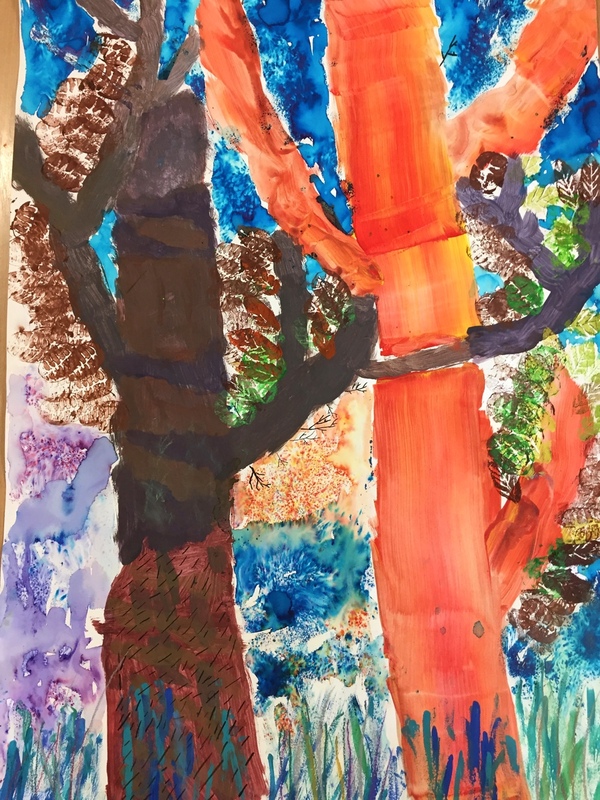 I think the large scale work enabled the children to work in a much freer way, laughing and rushing to each other showing the amazing colours they had made. They are much more confident artists now and relish big sheets of paper, knowing they can achieve, interestingly there has been a marked improvement in small scale drawing as well. Dear Access Art: I so love viewing your site it is absolutely so inspiring to me. At times I am so at a loss as to inspiration and ideas, you lift my spirits when I see what your teachers do with students, and with your teacher led workshops which are so intense and are filled with creativity and not bound down to rote repeated data and curriculum instruction, which is a part of what we do as art teachers but I find that there is absolutely No stimulation at a valid organic level in my school. Thank you Access Art for showing what it could BE!!!!! !